When is a house not a home? When it is ‘The House’, a new restaurant venture from the owner Hans from Denmark (originally) and the chef Pom, Thai (originally but who has worked in South Africa, Guam and Bangkok, amongst others). The building itself has its own history - built for Lanna Royalty, it has gone through a few owners, but lay empty for 20 years. It is now almost rebuilt, restored to much of its former glory. Polished wooden floors and pale pastel blue walls, combine with the high white ceilings to give a very spacious effect. All round the main dining room are windows, to again give an airy feel to it all. The tables have white tablecloths, with white linen napkins, the glasses are different, and the crockery was a colourful ‘celadon’ style, with deep glazing. Chairs are cane, with pillows, thank you! 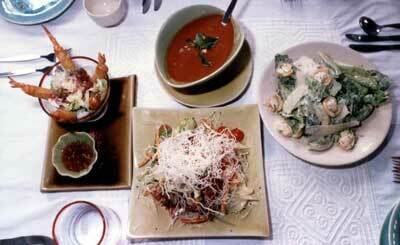 The menu is not extensive, and will change every six to eight weeks. The current one commences with appetizers B. 150-220 with a roast tomato and pepper soup with spicy chickpea at the lower end and a salmon sashimi with mustard and ginger vinaigrette at the top end. These are followed by five salads (B. 100-210) with a most interesting sounding avocado roll filled with crab and chilli mayonnaise accompanied by wasabi vinaigrette (regular readers will know just how much Miss Terry loves wasabi!). There are eight choices of mains - beginning with B. 230 for the inexpensive lemongrass, ginger and parmesan risotto cake with sweet potato coconut curry and tomato red pepper sauce (a vegetarian dish by the way) through lamb, fillet steak, duck, chicken, sea bass to Tasmanian salmon with mussels, scallops and prawns in a yellow wine infused shellfish broth at B. 550. Wines? The wine list is varied and rather inexpensive for what is on offer. You can have a quaffable red or white from as little as B. 690 and even a Chateauneuf du Pape was only 1,550. Try the Yalumba Barossa Shiraz 2000 (2 Gold Medals), from Horeca, the local supplier (Rudy Van Den Berg) for a good Aussie red. We agreed upon a ‘tasting’ lunch for the expanded four person Dining Out Team, with four starters and four mains, shared between the quartet. We began with a cold gazpacho-style tomato soup, which had a wonderful hint of basil and coriander and followed that with a delicately cooked wrapped prawn spring roll with its own excellent tangerine salad and sweet chilli sauce. Very, very nice. The next two items were extremely interesting for ‘foodies’, allowing a direct comparison between the ‘House’ salad and a Caesar salad - and how different they were. The Caesar was a very cheesy one with gorgonzola and parmesan, a very powerful taste, while the House salad was more oriental, relying on the many different vegetables to give the subtlety of flavour. For mains we shared a duck breast on a bed of red cabbage, a chicken breast roasted with Macadamia nuts, some imported lamb on a spinach base, and a salmon steak on a bed of egg noodles. Interestingly, we all had different favourites, with Madame going for the duck, while I was enraptured by the salmon, which had a very different sauce that turned out to be a Japanese Miso - sweet and sharp at the same time. Loved it! Mention should also be made of the presentation - food as art! Or was it art as food? Stunningly well done. Any review of this restaurant has to emphasize the venue. The House is grand, it is stately, it is charming, and any function or just private dining is enhanced by the building itself. The Dining Out Team loved it. In that ambience, put out some good food items, brilliantly presented and keenly priced, and you have the recipe for success. Provided The House can maintain the standard that we enjoyed, it will do very well in Chiang Mai. Although this is still the ‘soft opening’ period, this restaurant is well worth a visit. Highly recommended.